Wash the toor daal well in warm water. In a pressure cooker add the daal with 3 cup of water,2 crushed garlic.half of the chopped onion and tomatoes.1/4tsp of turmeric powder,1tbsp of sambar powder,salt and the castor oil. Bring to boil at three whistle and keep aside. Coat a heavy wok with 2tbsp of oil,add the mustard seed. Once it starts to cracked,add the cumin seeds,curry leaves, remaining chopped onions.tomatoes and garlic. 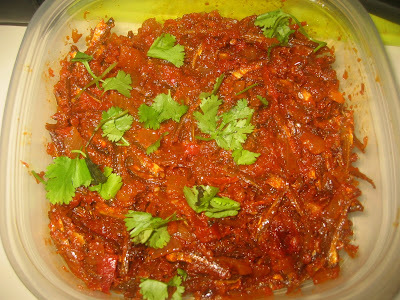 Once the tomatoes and onions cooked add the mullangi. Then add chilli powder and the remaining sambar powder. Let it cook for 10 minute, add the tamarind pulp. Cover and let the mullangi cook in tamarind pulp for another 10 minutes. Remove the lid and pour in the daal mixture. Adjust the level of salt and let the mixture to boil. Remove from flame and serve with chopped coriander leaves.